Real World DC cast joins in! Kudos for the RWDC guys for playing along in some good, wholesome, blood-drenched, brain-eating fun. Check out the awesome photoset with all the fun thanks to Paivi. 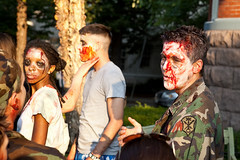 UPDATE: Apparently the Real World zombie involvement devolved into threats of violence.